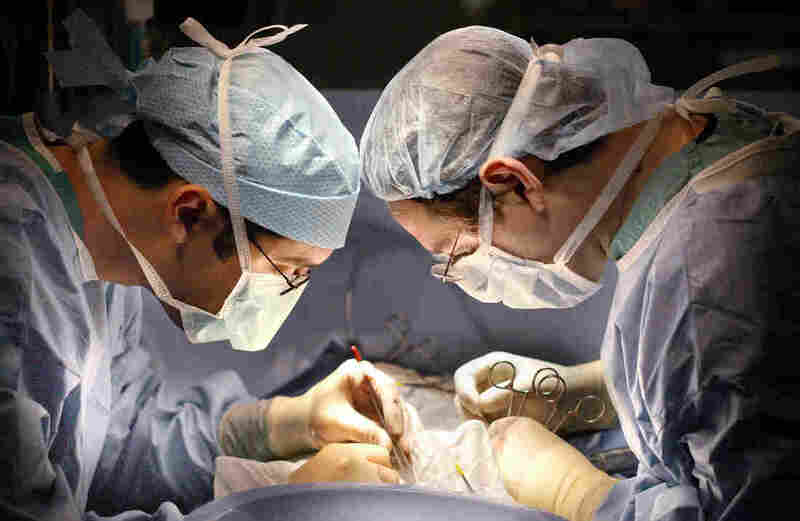 New Source Of Transplant Organs For Patients With HIV: Others With HIV : Shots - Health News The organ donor and both recipients in the procedure this month were all HIV-positive — a first in the U.S. Using HIV-positive organs for some patients could enable a thousand more transplants a year. Dr. Dorry Segev (right), of Johns Hopkins Medicine, led the team of doctors that transplanted an HIV-positive liver and kidney into two different HIV-positive patients this month. "It occurred to us that there are thousands of patients with HIV in need of kidney transplants, liver transplants, who were waiting on waiting lists and suffered high risks of dying while waiting for these organs," says Segev. "And at the same time, we were throwing away organs from donors infected with HIV just because they were infected with HIV. These were potentially perfectly good organs for these patients." "At that time, in the 1980s, this made sense," Segev says, "because HIV/AIDS was deadly disease." And medical accidents with HIV had made transplant teams skittish. "The virus had been transmitted inadvertently in quite a number of patients with solid-organ transplants," says Dr. Peter Stock, a transplant surgeon at the University of California, San Francisco. Stock says there was another reason doctors were reluctant to use the virus-infected organs. In order for anyone's body to adopt a new heart, liver or kidney as its own, the organ recipient must take certain drugs that suppress the immune system. But AIDS also suppresses the immune system, and surgeons worried that an organ transplant in someone infected with the virus that causes AIDS might actually do more harm than good. "It didn't make sense," Stock says. "We were afraid we would cause rapid progression of HIV to AIDS and death." Segev, who led the team that conducted the U.S. surgeries earlier this month, says the time just seemed right to start doing the transplants at Hopkins. "It all came together," Segev says. "So, this was a six-year challenge that involved identifying a problem that affected our patients, doing the research to better understand that problem, taking that to the Hill, getting the bill passed." Now he and his colleagues are working to make sure that the two patients who got these organs stay healthy. One is already at home, the other recovering in the hospital. The doctors also are working with 30 other hospitals in the U.S. to get similar surgeries going across the country. Transplant candidates can still opt to wait for an HIV-negative organ if they prefer, Segev notes. "We want to make sure," he says, "that we don't take people who have a relatively nonresistant form [of HIV] and then give them something from a donor who had pretty high-resistance patterns, thereby requiring them to make major changes to their regimen, and maybe even have an HIV that would be less easy to control." Many people with HIV are expected to opt for the shorter wait period that getting an HIV-positive organ may entail. And that should slightly shorten the wait period for all transplant candidates, Stock says. "Our waiting lists are off the charts," he adds. "If you're in the Bay Area and you're waiting for a kidney for specific blood types, you're waiting seven to eight years, so anything we can do to increase the organ supply is so important."